Hard bargaining in Bonn this week will probably decide whether the crucial climate talks in Paris in December can save human civilisation from ultimate collapse. LONDON, 1 June, 2015 − The text of the agreement on how the world will tackle climate change and set targets that will keep global temperatures from rising more than 2°C above pre-industrial levels is being negotiated in Bonn this week. The 2°C limit has been set by politicians to prevent the planet overheating dangerously − but the cuts in carbon emissions required to achieve it have so far not been agreed. It is this gap between the policy goals agreed by world leaders and their lack of action to achieve them that the Bonn conference seeks to address. The meeting, which opened today, will last for 10 days as working groups grapple with action to reduce carbon emissions, how to finance technology transfer, and how to adapt to sea level rise and other unavoidable consequences of present warming − such as the current heatwave affecting India, where temperatures in some southern states have topped 47°C. Scientists and environment groups have said that this year’s negotiations are humanity’s “Last Chance Saloon”. If steep emissions cuts are not agreed and implemented quickly, the global temperature has little chance of staying under 2°C − with devastating consequences for the natural world and human civilisation. There are signs that momentum towards agreement is increasing. A report by Globe International, which will be given to delegates, reveals that three-quarters of the world’s annual emissions of greenhouse gases are now limited by national targets. The 2015 Global Climate Legislation Study shows that the number of climate laws and policies aimed at limiting emissions passed by national governments had increased to 804 this year, up from 426 in 2009 when the Copenhagen climate talks collapsed, and from just 54 in 1997 when the Kyoto Protocol was agreed. The lead author of the study, Michal Nachmany, a researcher at the Grantham Research Institute on Climate Change, says: “With three-quarters of the world’s greenhouse gas emissions now covered by national targets, we can be more confident about the credibility of the pledges that countries will make ahead of the crucial summit in Paris. Professor Samuel Fankhauser, co-director of the Grantham Institute and co-author of the study, says: “Every five or so years, the number of climate laws and policies across the world has doubled. This growing amount of legislation provides evidence that the world’s major emitters are taking serious steps to tackle climate change in their countries. The problem is, as the report points out, that current targets and timetables to achieve them are not enough to limit greenhouse gases sufficiently to get below the agreed 2°C limit. However, politicians are coming under pressure to improve their pledges. Ahead of the Bonn meeting, a business summit in Paris showed that many companies are pushing their political leaders for action. This is a marked change from the last two decades, a time when the fossil fuel industry has lobbied to slow decisions on tackling climate change. In Paris, 25 worldwide business networks − representing 6.5 million companies from 130 countries − demanded political action to achieve a low-emission, climate-resilient economy. Christiana Figueres, executive secretary of the UN Framework Convention on Climate Change (UNFCCC), the organiser of the Bonn conference, says: “With some 200 days to the UN climate convention conference in Paris, the growing momentum for change and for action is rapidly gaining ground across countries, companies, cities and citizens. Whether this optimism is justified will be seen in the next week as the working groups refine the technical agreements that heads of governments are expected to sign in Paris in December. Among the many recurring problems that have created a stumbling block is the amount of money pledged by rich nations to developing countries to help them avoid fossil fuel use and adapt to climate change. So far, the pledges to provide billions of dollars in technical help and adaptation have not been followed by the cash. As well as trying to seal an agreement for action after 2020, the Bonn conference is also working to accelerate action in the five years until then – which are currently covered by no legally-binding international agreement. The particular focus here will be on scaling up the use of renewable energy and energy efficiency in urban areas. The fact that China and the US are now working together to reach an agreement in Paris is also helping move the talks along. However, some developing countries, notably India, are still saying their priority is lifting their poor out of poverty, rather than reducing their emissions. Arctic sea ice has hit a record low for its maximum extent in winter, which scientists said was a result of climate change and abnormal weather patterns. 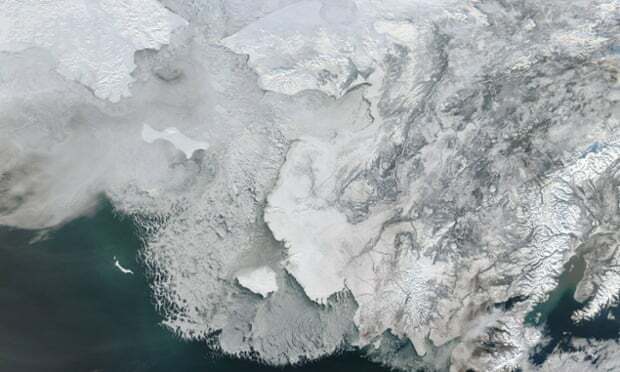 The US National Snow and Ice Data Centre (NSIDC) said on Thursday that at its peak the ice covered just over 14.5m sq km of the northern seas. This was 130,000 sq km smaller than the previous lowest maximum in 2011. The peak occurred on 25 February, which the NSIDC’s senior research scientist Ted Scambos said was “very early but not unprecedented”. Climate change is driving declining ice coverage in the Arctic, with a recent study finding it has also become significantly thinner, down 65% since 1975. Scambos said northern oceans have progressively warmed because of climate change. This winter, the warmer seas combined with mild weather to create exceptionally poor conditions for the annual freeze. Bob Ward, at the Grantham Research Institute on Climate Change and the Environment at LSE, said: “This is further evidence that global warming and its impacts have not stopped despite the inaccurate and misleading claims of climate change ‘sceptics’. The most pronounced deviation from the 1981-2010 average cover was in the Bering and Okhotsk seas in the northern Pacific. There, the ice edge was 100-200km further north than in a normal year. After March the summer thaw will begin, with the ice retreating towards its summer minimum, which usually occurs in September. The summer ice cover in the Arctic is also on a long-term decline, although Scambos says a low winter maximum does not necessarily indicate a low minimum is on the way. The loss of ice from the Arctic has raised questions over when the region will experience its first ice-free summer. Scambos said he expects the summer minimum to dip below 1m sq km (386,100 sq miles) within the next 15 years. At this stage, he said, the Arctic will be profoundly changed. The absence of sea ice and abnormally mild weather affects communities and wildlife in the Arctic circle, which are adapted to extreme conditions. In Svalbard, Kim Holmén, the international director of the Norwegian Polar Institute, said the fjords there remained unfrozen and instead of the normal snowfall the island experienced rain which froze when it hit the ground. Too much ice on the land and none in the sea has also made life difficult for the 2,600 people who live on Svalbard. He said this type of weather is expected to become normal under a changing climate. “This winter is an example of what we believe will become more common and has profound influence on the reindeer and the ptarmigan [a species of bird] and other creatures that roam the land,” he said. This week, on the opposite side of the Arctic Ocean, Alaska’s Iditarod sled race was forced to shift its start 362km (225 miles) further north due to a lack of snow. This has only happened once before in the race’s 43-year history, in 2003. Meanwhile, the NSIDC said ice floes surrounding Antarctica reached a relatively high summer minimum on 20 February. The extent of ice was 1.38m sq km, the fourth largest on record. Antarctic sea ice has confounded some scientific modelling by growing in recent years. There are several theories why the extent of the ice is growing despite a general warming trend across the southern continent.